Before Portland State was a university or college, it was the Vanport Extension Center (VEC), founded in 1946 to serve veterans returning from World War II and wanting to take advantage of the G.I. Bill. The first classes were offered in the city of Vanport, Oregon (now the site of Delta Park and the Portland International Speedway) in summer of 1946. The first editor of the student newspaper, Don Carlo (at right), was a remarkable man. Carlo started writing news stories as a child and worked on the student newspaper at Washington High School in Southeast Portland. In 1940, following high school graduation, he enrolled in the journalism program at the University of Oregon, but left after a year to work for the San Francisco Chronicle. He was then called up to serve in the army, where he established and edited post newspapers. Carlo lost his vision in an accident in the army in about early 1945. 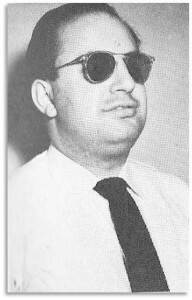 He then attended the army school for the blind, based at a hospital in Connecticut, where he learned Braille in just a few months and started a newspaper for the hospital with an accompanying Braille edition. By summer of 1946, Don Carlo was 24 and enrolled at the Vanport Extension Center back home in Oregon. 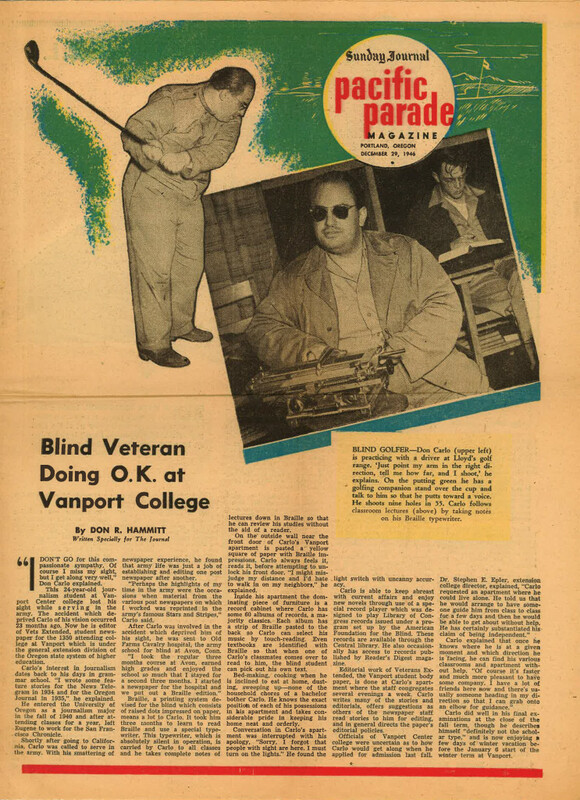 An article in the Sunday Journal Pacific Parade Magazine says Carlo was able to live and study independently in Vanport: “Bed-making, cooking when he is inclined to eat at home, dusting, sweeping up, none of the household chores of a bachelor bother Carlo.” He carried a Braille typewriter to classes and listened to news and novels on record. And during his free time? He golfed! “On the putting green he has a golfing companion stand over the cup and talk to him so that he putts toward a voice. He shoots nine holes in 55,” wrote the Pacific Parade. 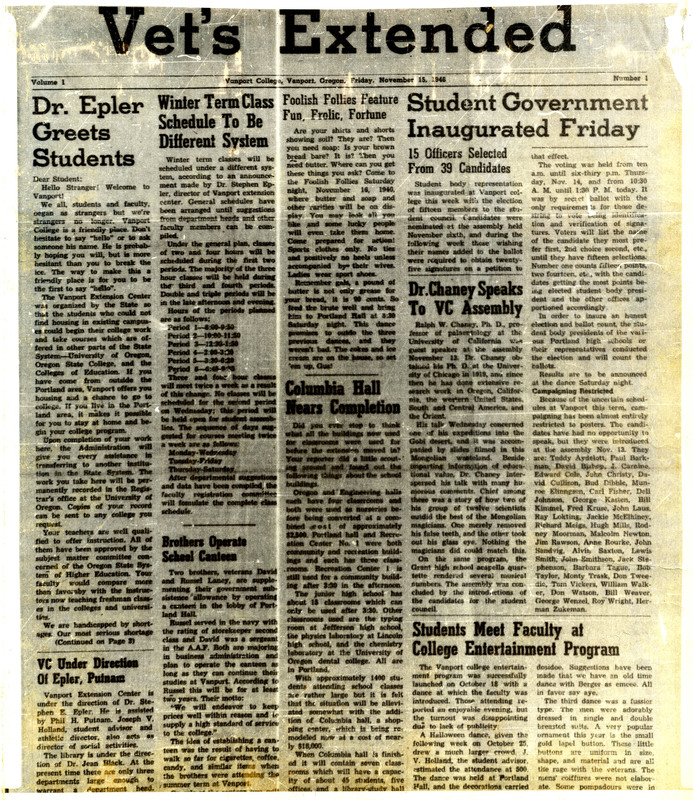 Just a few months after the first issue of the Vet’s Extended, the newspaper’s name was changed to The Vanguard, which remains the flagship student paper at Portland State today. Don Carlo was remarkable in 1946 and remains so today. Thanks to Don Carlo and the many veterans throughout the years at Vanport Extension Center, Portland State College, and Portland State University. Learn more about the early days of Portland State University at the Vanport Extension Center in a digital exhibit, The Vanport Extension Center, 1946-48, from PSU Library University Archives. Dodds, Gordon B. The College That Would Not Die: The First Fifty Years of Portland State University, 1946-1996. Portland, OR: Oregon Historical Society Press, 2000. Hammit, Don R. “Blind Veteran Doing O.K. at Vanport College,” Sunday Journal Pacific Parade Magazine, December 29, 1946.